The Family Centred Practices Group (FCPG) is dedicated to providing services that are in line with current research in the field of autism. Over the past 50 years, a research base has developed in this field. From this research, we have been able to determine the necessary components for effective programs designed to educate young children with autism diagnoses. These components comprise “best practice”. The Family Centred Practices Group prides itself on providing excellent intervention that is in line with best practice in supporting children with autism. The following is a summary of the 13 components of best practice programming for young children with autism diagnoses, as compiled from the available literature in the field. In addition, we have provided a description of how FCPG fulfills each requirement. Individuals providing applied behaviour analytic services to young children with autism should be highly competent, and qualified. Behaviour Analysts should provide services within the limits of their expertise. Professional development should be ongoing. Clinical Director and Senior Consultants are all Board Certified Behaviour Analysts™ (BCBA). BCBA/BCaBA mentorship process for all Program Supervisors & Behaviour Consultants. Supervision by qualified Behaviour Analysts for all of our team members. M.Ed./ M.A. degrees or Douglas College program certification pursued or obtained by all Program Supervisors or Consultants. Regular workshop/conference attendance and or participation by team members. FCPG’s Senior Advisor holds a Ph.D. and is a professor emeritus in the Department of Educational Psychology at the University of Alberta. Parents and families know their children best, and spend the most time with their children. Families should be highly involved in setting and guiding program goals and objectives, as well as generalizing learning objective across the child’s day and environments. Parents should be provided with ongoing training and support. We believe that a child’s ability to learn and to grow is intertwined with the strengths, needs and philosophies of his or her family. Our goal is to enhance the natural capacities of the family to identify needs/risks, to mobilize skills and to set their own priorities for intervention. Parents help guide program direction from the start. Initial completion of our integrated curriculum checklist, as well as other assessments and interviews (e.g., ABLLS) helps us to create an initial Behavioural Plan of Intervention for their child. We encourage parents to share successes and concerns on an ongoing basis and use this information to guide programming. Parents play an integral part in helping their children to generalize program objectives. Parent training and support is provided on an ongoing basis in the home. Behavioural Parenting Workshop Series (i.e., workshops on topics indicated as priority by families) is provided periodically. Intervention procedures used and or recommended should be empirically validated (supported by research). Teaching strategies should be based on the principles of Applied Behaviour Analysis (ABA). We exclusively use research-based interventions in our work with young children with autism diagnoses. Our program is based in the principles of Applied Behaviour Analysis (ABA) which has been well documented as the teaching method of choice for educating young children with autism. Each child with an autism diagnosis is unique. Programs should therefore be individually tailored to the needs of each individual child. Programs are built & tailored for each child based on individual strengths, needs and preferences (as identified in ongoing assessments/observations/interviews ). Changes are made to the child’s plan on an ongoing basis based on individual needs that arise as time passes (ongoing assessment, monitoring, evaluation, measurement). Programs designed to educate young children with autism should include instructions in the following skill areas as needed: attention, imitation, play, social skills, language use and comprehension. We conduct initial and ongoing assessments to determine individual children’s needs and relative strengths in each of these and other areas. We develop individualized content based on parent priorities & assessment for each child in our program. Assessments used to develop individualized Behavioural Plans of Intervention include over 25 areas of specialized content. Effective intervention for children with autism takes place 20-40 hours per week. We recommend that families arrange to have a minimum of 20 hours of intervention per week for their child. Challenging behaviour should be approached from a functional perspective (i.e., What is the purpose of the behaviour?). A focus should be placed on teaching alternative, appropriate behaviour that serves to replace problem behaviour. We believe that all behaviour, including problematic behaviour, serves a function. Our team is trained to provide Functional Behavioural Assessment (FBA) and Positive Behaviour Support (PBS) services to families as needed. A FBA is an interview and observation process that uncovers the function/purpose of the behaviour, identifies the relationship between the environment and the behaviour and culminates the design of the PBS plan. PBS is a proactive approach to dealing with challenging behaviour utilizing a team effort (i.e., involving all key people in the child’s environment). The teaching environment for young children with autism should be highly structured, involving a great deal of predictability and routine. The teaching environments are systematically arranged to enhance learning. We provide predictability and routine for the children whom we support through the provision of task organizers, clear expectations, and support through transitions. Initially teaching occurs in a highly structured setting, and in time, as the child becomes ready, sessions become less structured and more naturalistic. Quality ABA-based programs should use a variety of structured and naturalistic teaching strategies. A focus should be placed on spontaneous functional communication. 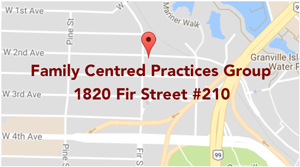 The Family Centered Practices Group uses a variety of structured and naturalistic teaching strategies including Discrete Trial Teaching, Milieu Teaching, Incidental Teaching, Natural Teaching Strategies, and Social Skills Instruction. Some of our teaching strategies are adult driven, whereas others focus on spontaneous functional communication on the part of the child. The teaching environment is arranged to promote this type of child-initiated communication. All of our teaching practices are supported by published literature. The degree of structure and intensity of teaching is individualised and geared to the functional abilities of the child. Learned skills should be systematically generalized into a child’s natural environment. Teaching environments should initially be highly supportive, while gradually becoming more similar to a child’s natural environment. Skills should be taught by a variety of individuals, across numerous settings. Typically intervention starts in the home and is gradually transferred to a variety of environments as time goes on. When possible, we offer intervention and support across home, school, play date situations, and community settings and collaborate with professionals in each of these settings. We work towards generalization from the start. Through the use of multiple exemplars, instructions, scenarios, etc., we teach children to use their learned skills across a variety of settings and situations. Additional variables (e.g., distracters, people, etc.) are also systematically varied to ensure that learning is generalized. We work with parents & teachers to ensure that generalization has occurred. Children with autism diagnoses benefit from regular access to typical peer models. Although we are predominately a home based program, we encourage parents to enrol their children in daycare or preschool classes and/or other community programs. We do occasionally provide intervention in these settings based on the needs of individual families. We collaborate with daycares, preschools & playgroups, and provide consultation in these settings as needed. We also help to support parents and interventionists to facilitate in home play dates with typically developing peers. When children are school-age, we collaborate with and provide support to their school-based team as required. Progress should be monitored on an ongoing basis and adjustments should be made as needed. Evaluation of a child’s progress occurs regularly at team meetings, and during observations both in person and via video. All decisions re: programming, progress, problem behaviour, etc. are data driven. Evaluation of the effectiveness of the individualized intervention strategies is ongoing (determined by continuous measurement of targeted behaviours). Modifications are made as required to maintain and/or increase the effectiveness and efficiency of the interventions. The transition from preschool to kindergarten is challenging for many children with autism. Creating a successful transition should be a focal point in programs supporting young children with autism. Our services are geared towards helping children to ultimately be successful in the typical school environment. As the kindergarten transition approaches, we work closely with parents to set goals for their children. We also collaborate closely with school staff to ensure that the child’s transition is as successful as possible. Collaboration with the school team continues on an ongoing basis throughout the school year or as needed.